I got this idea from Pinterest a couple of years ago but had forgotten about it until a parent gave me a packet of out of date spaghetti. 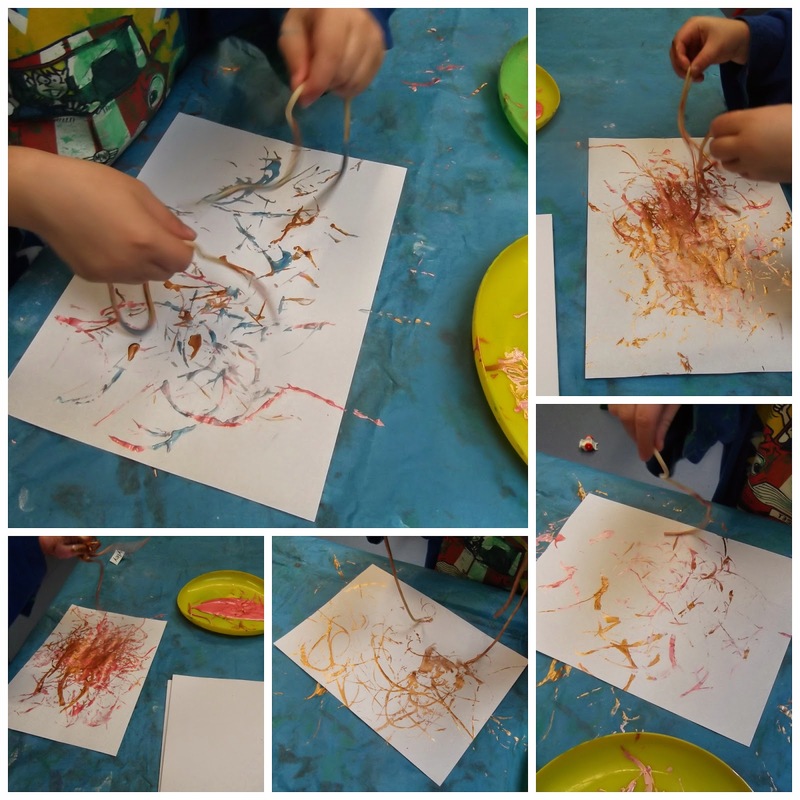 One child said he felt like a spider making a web, as he dragged the pasta around the page. Outdoor Play Party. 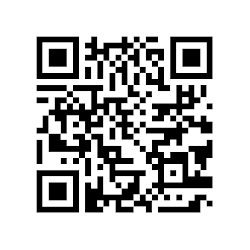 Making a Difference. I was fortunate to have a fantastic P.G.C.E Early Years student on her teaching practice with us for the past 5 weeks. It was great to have a fresh pair of eyes on our practice & to have someone full of new ideas working with us. Sometimes when you are in the middle of an environment it is very easy to take what you have or do for granted, then someone new comes along & it does make you take stock. Lesley from Takoma Park Cooperative Nursery School & I chat regularily to reflect on our practice & have often talked about 'being in our bubble', by this we mean that we can get so used to doing what we do in our settings that we can tend to assume everyone is doing the same. For the past 7 years we have been following a similar outdoor play approach; we go outside first thing every day, we allow stick play, going up & down slides, riding bikes in any direction & climbing is actively encouraged. We now just see this as the norm, so it was amazing to watch the initial reaction of the student, she was like a rabbit caught in the headlights, there were just too many 'new' things going on for her to take in! However I have to say, she fully embraced us & our ways, she bought waterproof trousers, boots & a coat. In the past most students have been happy to borrow spares from us but this lady wanted her own 'for next time'. 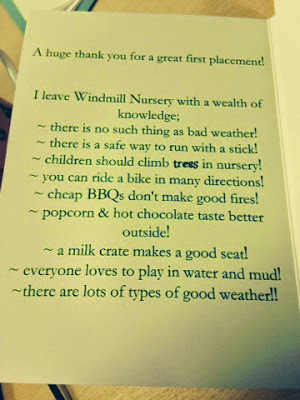 I have no doubt that when she has her own class in the future, she will do her best to introduce some if not all of the many 'firsts' she saw at Windmill! My favourite post in the last link up was from a lovely new blog to me, Wild Tales Of..... 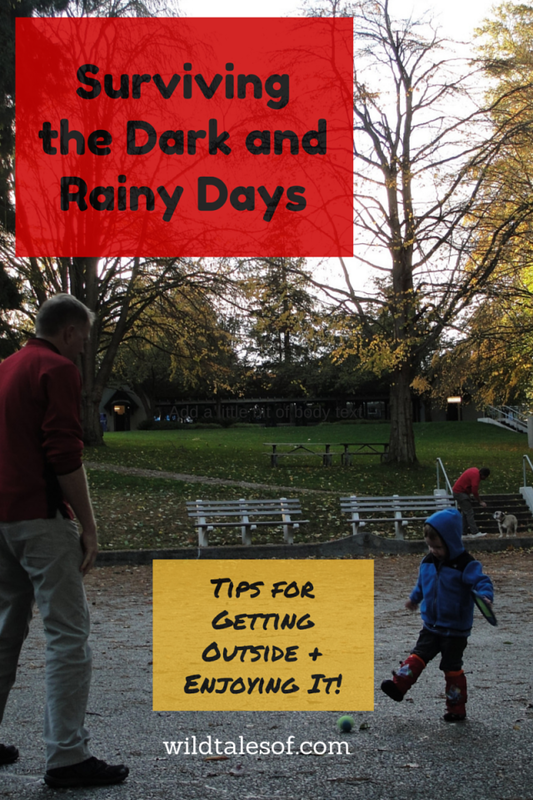 This fab post is full of practical tips for anyone to try to ensure they can get outside even in the depths of Winter. As Kate points out, living in Seattle if she waits for dry days to just go outside, she is going to spend lots of time indoors! Transient Art In Bear Woods. Some of you might have already seen the mouse mats I picked up in the scrap store over the summer, I got about 60 of them altogether & figured we would use them as seats when up in Bear Woods. Then we began to use them in the playground as seats around the fire when the logs were damp but we still took some up to Bear Woods each week in case anyone wanted a seat but really when in their rain gear the children are happy enough to just sit on the grass, stumps of pallets. One child had turned them over one day & chalked on the black side, so I then wondered about using them as a background for some transient art. all it took was for me to bring some out & then sit down & start making a picture myself before some children wandered over to see what I was doing & then they wanted to make their own. Some were a little confused by the fact the 'art' didn't stay on the 'page' but once they realised they could tip everything off & then start all over again, they fully embraced the idea. The mats are brightly coloured & even the coloured side made a nice background for the art too. Now of course I am mad I didn't take loads more! Outdoor Play Party - Welcome to two new co-hosts! 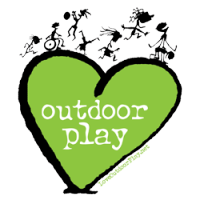 I am delighted to announce we have 2 new co-hosts for the Outdoor Play Party, joining in with myself, Jen from Kitchen Counter Chronicles & Leila from Mud, Mud Marvellous Mud are Linda from Rain or Shine Mamma & Catherine from Adventure Togs. I am very excited to have 2 such amazing bloggers joiing in the fun with us & to have 5 fabulous ambassadors for outdoor play all working together in the one spot! I am still pretty amazed to have vistors to the nursery declare that we are unique or special simply because we go outside every day for at least an hour - I am a bit weary of the question 'But not every day - not in the rain?' - and the shaking of heads when I say yes, every day & some seem to find it hard to believe that we are not forcing the children to be outside. Sometimes when visitors are due at the school they will purposely choose to arrive after 10.30 when they know we will be inside! But if only they would arrive an hour earlier they would see how purposeful & settled the play is outdoors, the children are spread all over the space engaged very different activities - some might be 'cooking' in the mud kitchen, some might be reading in the book corner under the slide, others might be climbing on the logs & stumps, some might be playing on the slide, others eating snack, whilst others will be playing at the various tables under the roof. As the temperatures dropped in the last few days, the children have begun to look for the gloves & extra coats we have on offer. I try to ask the parents to layer the children up rather than just 1 big heavy coat. Most of the adults wear long sleeved t-shirts under their polo shirts, as well as fleeces under their coats but we are aware that we are moving about just as much as some of the children so they may not need just as many layers but it's better to be too warm than too cold. 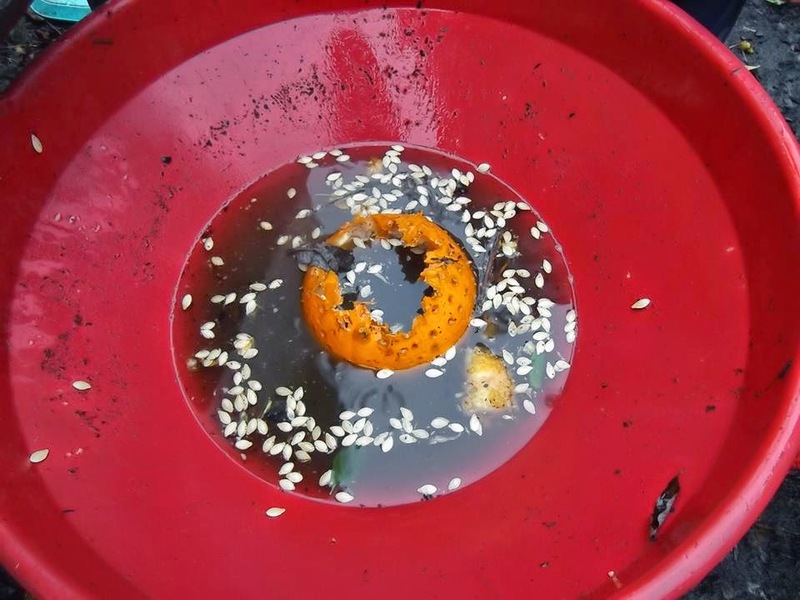 After the children were finished pounding golf tees into some pumpkins I put them into the mud kitchen & they have had so much fun playing with them - the seeds have been added to the leaves, bark chips & pine cones as ingredients for all the cooking they do. They have had fun watching them float in the big red top & they have become the key ingredient in pumpkin soup. We've had 2 fires so far, we cooked some popcorn & then some hot chocolate with mini marshmallows - always a firm favourite & for the next fire we plan to have hot chocolate again. The children have been really good at walking around the outside of the fire circle & loved smelling the smoke from the wood on the fire. It's always amazing to see children who wouldn't normally drink milk taking hot chocolate - everything really does taste better with chocolate! 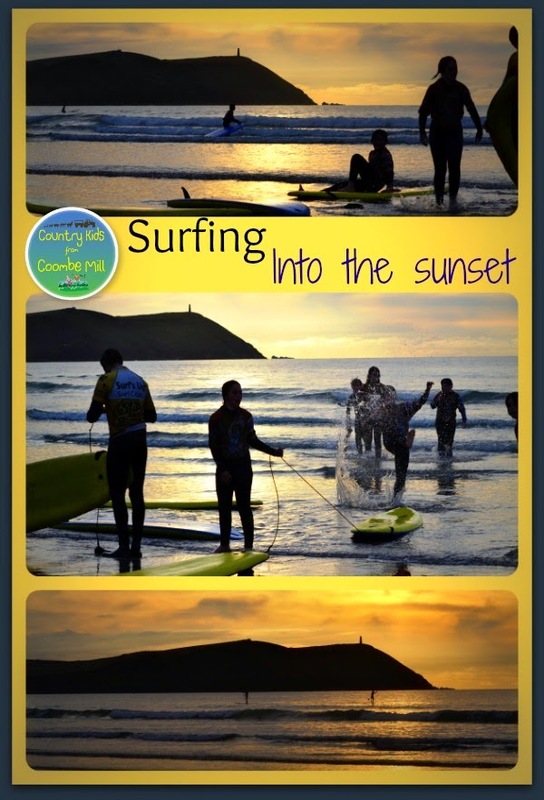 My favourite post from the last Outdoor Play Party was from Coombemill featuring some of the #countrykids out surfing - the photos in Fiona's posts are always great but the sunsets in this post were outstanding.